What is the Waterjet Cutting Process? Both Water only and Abrasive Water Jet Cutting are the technologies used by Precision Waterjet. We use them to cut virtually any shape in any material. You may have heard of the generic terms "Waterjet", "Abrasive jet" and "Flowjet". Waterjet cutting technology has been around since the early seventies. It was of little value to engineers as then it was only capable of cutting thin gasket and foam materials. High Pressure water cutting with Abrasive feed extended the concept about 10 years later. Both technologies use the principle of pressurising water to extremely high pressures. Also allowing the water to escape through a very small opening (typically called the "orifice" or "jewel"). Water only waterjets use the beam of water exiting the orifice (or jewel) to cut soft materials like confectionery and foam. However are not effective for cutting harder materials. 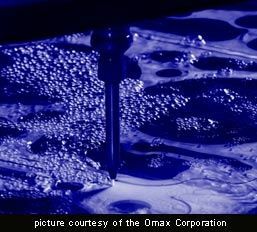 Abrasive waterjets use that same beam of water to accelerate abrasive particles to speed fast enough to cut through metal. Today, cutting through 200mm of stainless steel, with a square edge, too close tolerance is no longer fiction. It is a reality with the right type of machine.